There is quite a bit of confusion regarding the use of an AFO rather than below-knee cast following Achilles surgery (percutaneous/SPML/or traditional). The best long term outcome with regard to functi on is a light fiberglass cast applied in the operating room AFTER correction of the foot to leg soft tissue and skeletal position has been obtained. Some may refer to this Below the knee light weight walking cast as a “temporary AFO”. The intent? Not to fully immobilize the child. However, while a custom fabricated AFO is being manufactured from an intra-operative “mold” or plaster impression cast, the fiberglass cast offers some pain relief and maintains the correct foot to leg position during initial healing. 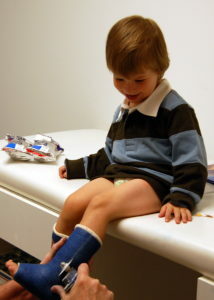 The casts are worn for 2-4 weeks until the child is ready for AFOs. These “temporary AFOs” don’t sound as scary as the word “casts” but are the same thing and should not be confused with typically used post-operative AFOs. Muscle atrophy is a commonly cited reason for “not wanting” BK fiberglass c ast(s). They are not ‘fracture’ casts. They are meant for stepping and walking. There is no resultant atrophy of muscle when the child is active. The cast, like the AFO, should have trimlines below the knee and no further than the MPJs (joints where the toes bend) to permit forward leg rotation with passive knee flexion for foot clearance and achieving a heel -toe gait. Stiff, rigid plastic to the end of the toes “trap” or block the leg over foot motion. 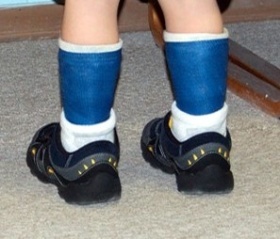 The child must then compensate for the AFO rather than use motion gained from the surgery. Although typically and traditionally ignored, the plantar contours of the foot segment of the AFO needs to be carefully molded to retain a normal calcaneal inclination. This lateral – plantar area of most AFOs is often “wiped-out” or artificially made “flat”. The calcaneus shifts back to an equinus within the AFO to encourage a recurring Achilles shortening. AFOs are immediately fit following cast removal as a tool for further assistance and guidance during transitions of movement and gait or learning to walk. The AFOs should offer sufficient weight bearing stabilization and encourage muscles that had not been used prior to surgery. The AFOs need to discourage the unwanted and undesired joint ranges and neuromotor activity observed prior to surgery similar to the post operative total contact casts that followed surgery IF your child had soft tissue surgery of the below knees. This is just wrong. It is bad medical practice and clearly not in the child’s best interest to place old AFOs on following a corrective surgery. The heel is poorly controlled and plantarflexed being held in a pre-surgery position. So is it “adequate” to use an old, ill fitting AFO for post operative care and management? The problem is with the ease that AFOs can be removed by child, parent and therapist; post operative casts should not be removed until it is time. 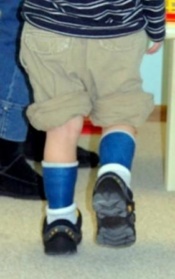 A walking cast of fiberglass cannot be removed by therapist or parent or child. With a non removeable BK walking cast, I know that the child is in it. With AFO wear? 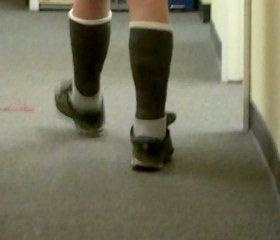 My guess is that it is often not worn because the child is uncomfortable; not from the AFO but from surgery. Using AFOs rather than walking casts to retain correction, position and comfort for the first several weeks after surgery is just wrong in so many ways.